Not only are we blessed to worship in a church that has withstood the test of time, but we are blessed to have as one our preachers and church members, Captain Keith Barker. Captain Barker literally grew up on our church. He fondly recalls the pew that he would lay his head on during church service as a little boy. And now, with a lifetime of experience devoted to work in the foreign mission field, today he stands in the same church of his youth preaching the Word of God. 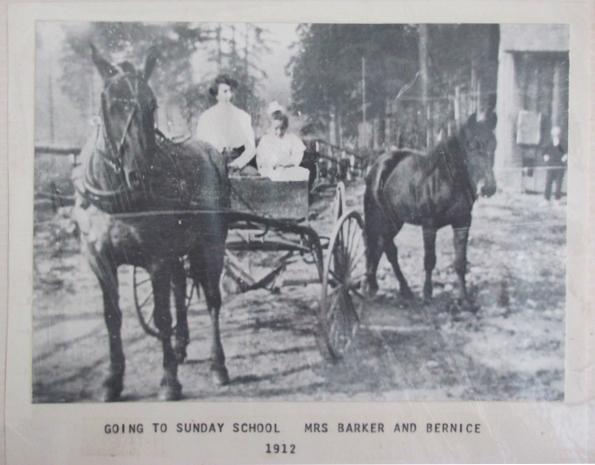 We are so grateful to have Captain Barker as a link to our church’s past. Below is his historical overview of the rich history that our little church in Scandia Valley has seen. 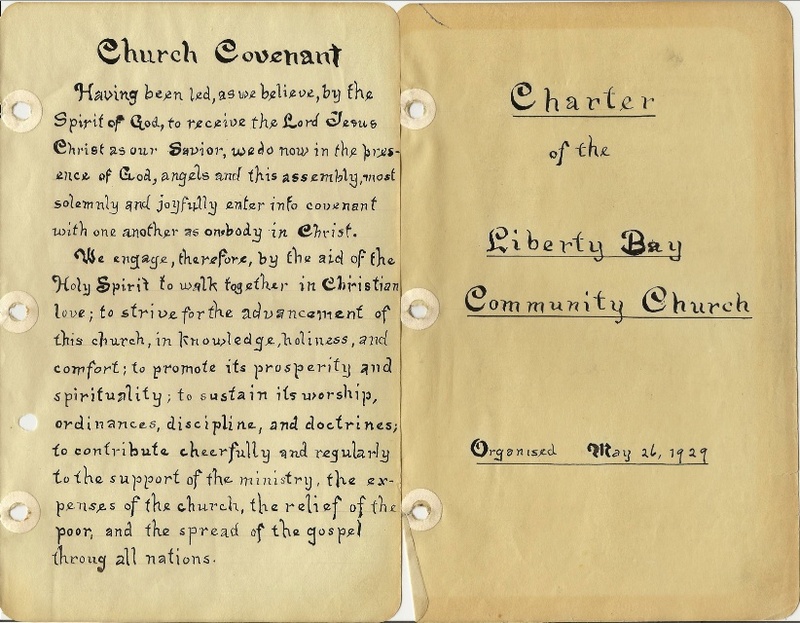 View the original title page of our Church’s Charter and its containing Covenant. The evening of March 27, 1929, a group of local pioneer farmers gathered at the home of Mr. and Mrs. Clark H. Barker located just north of Island Lake. The minutes of that event read, “After a short prayer meeting, the question of organizing a community church was brought up.” It was decided that the church should be named the Liberty Bay Community Church. 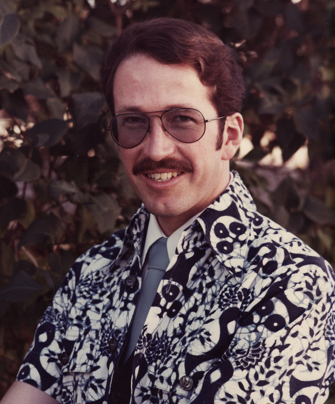 The first regular preacher was to be Dr. Jepson. Sunday afternoon, May 26, 1929, the first business meeting was held at the Scandia Union Hall. Mr. Andrew Johnson agreed to parcel off the corner of his farm field to establish a permanent witness for the Lord in the community. The Union Hall was located about a rock throw south and across the street from the location of the present church building. The building was moved down the dirt road on log rollers with the aid of men’s muscles, horse flesh and farm tractors. It was erected on logs for piers to level it over the sloping ground. Those log posts held the building safely in the air until the 1990’s. Funds were borrowed to pay farmer Johnson for his field. The minutes list the following folks as each donating $5.00 toward the loan: Mr. Hallman, Mr. Carlson, Mr. Johnson, Mr. Barker and Mrs. Schloskey. Scandia Valley was much more active in the early days. The Mosquito Fleet of Ferry boats made regular stops at the Scandia dock. The local store near the dock provided supplies for area families. Across the street from the present church was Toveri Hall owned by the Finnish community. It was a good sized building with a stage for community presentations like the area talent show. Other activities such as Saturday night dances (Polkas and Shodishes), wedding receptions and during WW II the ladies Aid Society gathered to make up bundles of bandages. The ‘plumbing’ was an outhouse in the back. The church on the corner was therefore ’downtown’ Scandia. The July 22, 1931, notes reveal that the church voted to give Mr. and Mrs. Holm of Brownsville ten dollars after their house burned down. January 30, 1936, the ‘Birthday Offering’ had risen to $9.34. It was voted to increase it to $10.00 and send it to the Klingborg Orphanage in New Britain, Connecticut. September 26, 1945, the members voted to join other area churches in the ministry of the Island Lake Bible Camp. This property was eventually given to Christa Ministries which has continued and expanded this excellent camp ministry. Early campers stayed in log cabins made from trees which had been fallen on the property as it was being cleared for the Bible camp. January 18, 1946, Mr. A. Johnson, who had originally sold the corner of his field for the establishment of the church, now donated more of his field so that a parsonage could be constructed. That same year a check was sent to an orphanage operated by the China Native Evangelization Crusade. January 12, 1947, the Silverdale Bible Church offered to sell their pews to Scandia for the sum of $275.00. Those pews are still used today, but have cushions to help folks thru the sermonizing. The treasurer’s report of September 2, 1948 reports that the general fund is overdrawn by $37.46 and there was $20.86 in the building fund but a bill of $39.87 remained unpaid. People at times gave sacrificially to keep the ministry afloat. Money was tight. The name has served well in that it clearly and simply presents the essentials in just three words. Over the 80 some years since its founding the doors have never been closed on a Sunday morning unless there was so much snow that travel was prohibitive. Pastors have moved on from SBC to foreign mission fields or other pastorates. Young people have grown up in the church and some headed off the Bible College and foreign missionary work. Marriages, funerals, baptisms and the faithful preaching of the Word of God has been the Scandia hallmark.